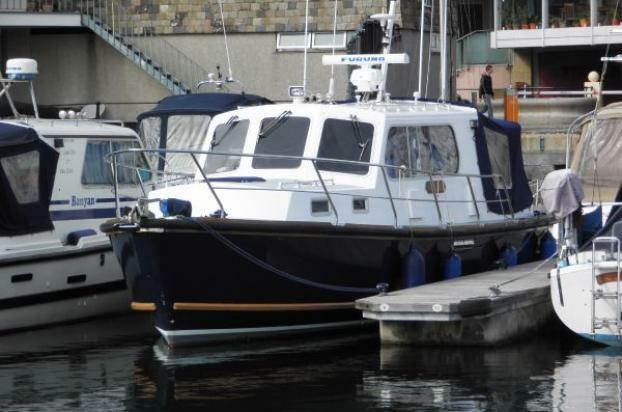 Channel Island 32 - 1980 - £29,950 New Listing - DRAFT DETAILS. "Gracie Jay" is a good example of the much admired Channel Island 32. This boat has been the subject of many major updates in 2009/10 including reconditioned engines, an extensive Furuno navigation instrument suite and a complete rewire to name just a few. Twin Ford Mermaid 'Turbo Four' 200hp turbo diesel engines - Fully reconditioned in 2009 by Hendy Power. Water - 130 ltr - Water tank replaced in 2009. 4 berths in 2 cabins. Forward cabin with a "V" shaped double berth with infill cushions, side shelves and hanging locker. Two port lights and an overhead opening deck hatch. Bi-Fold door. Heads: Port side separate heads compartment with an RM69toilet, corner wash basin with pressurised hot and cold water supply, shower, opening port light. Main Saloon: Wheelhouse/saloon with a starboard side helm position with seat, navigators seat opposite with a seat and chart table. Port side "L" shaped settee with saloon table, starboard side settee. Aft Cockpit: Large cockpit with an aft bench seat, teak cockpit table with cup holders. Blue hull with white superstructure and grey painted decks. Rubber D fendering. Furuno instrument package, and a full rewire.